Steve Sheet, fish porter for 15 years. Gary Durden, fish porter for 31 years. 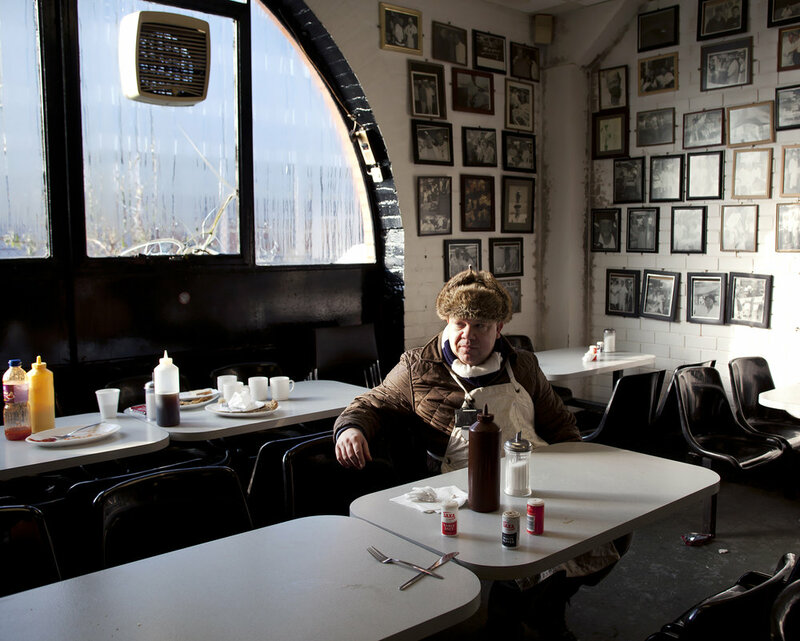 Gary Simmons, fish porter for 33 years. Market scene at Billingsgate. London 2012. Martin Bicker, fish porter for 24 years. Nick Wilson, fish porter for 12 years. The banter among the porters is legendary. London, 2011. Micky Durrell fish porter for 45 years. Brett Singers, shop boy for 3 years. Steve Jones, fish porter for 30 years. Tired porters eat breakfast together before heading home. London 2012. Micky Durrell and Brian Holmes are having a laugh. John Schofield, fish porter for 30 years. Three generations of Singers men working at the market. Bobby Jones, fish porter for 30 years. Jeff Willis, fish porter for 25 years. "The best part of work is now"
Jack Preston, fish porter for 2 years. Chris Gill, fish porter for 33 years. Empty market hall in the day time. On April 28th 2012 a centuries-old way of life and work officially came to an end. 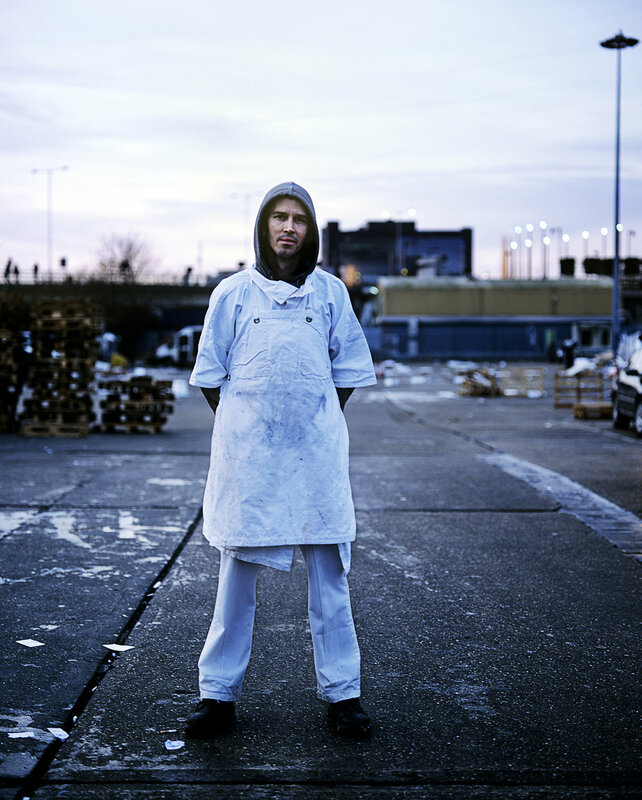 This is the story of the last of the Billingsgate Fish Market porters in London's Canary Wharf. Despite a tradition dating back centuries, they have now been stripped of their licenses by the City Corporation of London and will soon be replaced by a cheaper workforce. This is a story about a dying trade and the disappearance of longstanding heritage and identity. On April 28th 2012 a centuries-old way of life and work will officially come to an end. 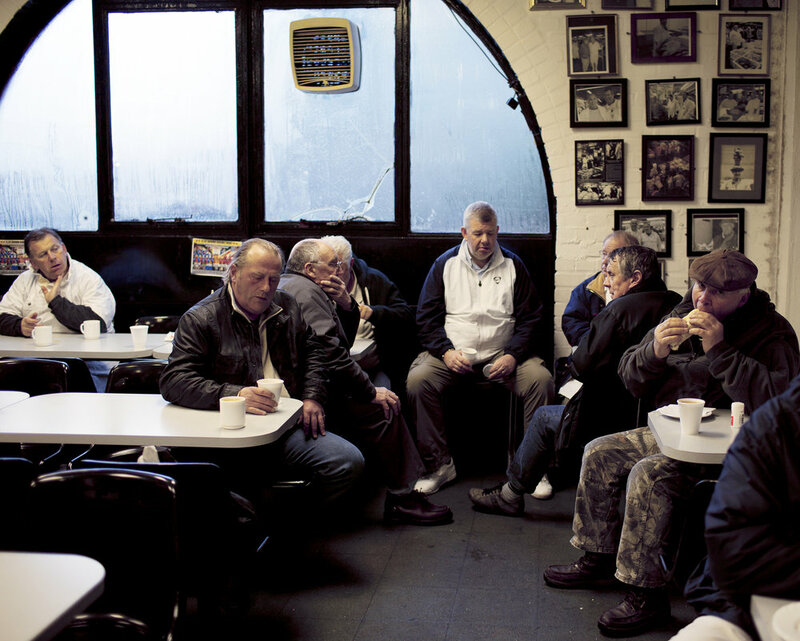 This is the story of the last of the Billingsgate Fish Market porters. Billingsgate Market began trading exclusively in fish in 1699. It comprised of two main groups: the merchants who sold the fish and the porters, who with their small numbered enamel badges, traditionally worn on their aprons, had sole licence to transport fish within the market. The portering system is based on the merchant paying the porter a fixed retainer and the fishmonger or customer paying a bobbin (today, 18 pence) per stone of fish delivered. A porter’s work is one of hard manual graft, carrying heavy boxes of fresh fish and working unsociable hours. Yet these men are proud of their enduring role and tradition. The job of porter has often been passed down through family generations, resulting in a very tight-knit community, complete with its own humorous banter and camaraderie. 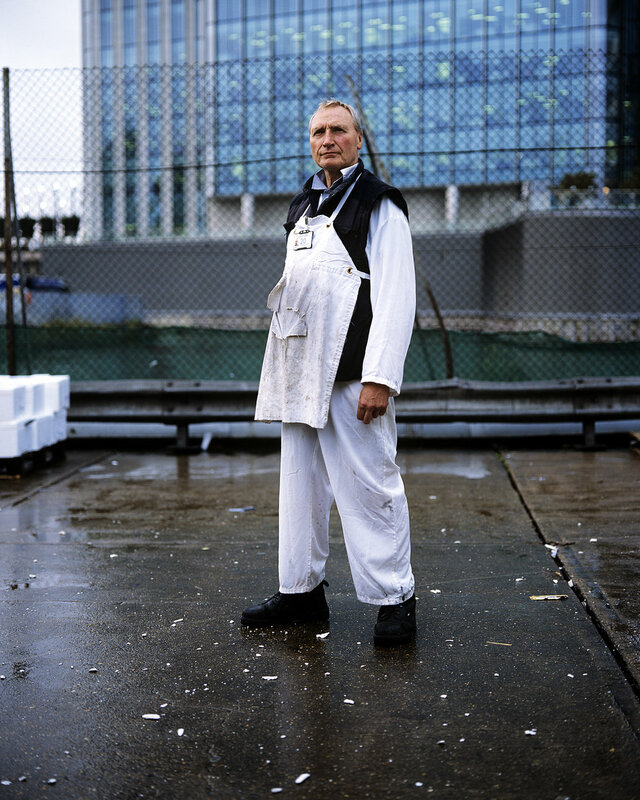 The porters have long been seen as the heart and soul of Billingsgate. In January 2012, the City of London Corporation – effectively an independent governing institution - withdrew all trading licences from the porters, revoking a bylaw dating back to 1876. Without this protection, the porters could legally be replaced by cheap casual labour. The LFMA (London Fish Merchants Association) has been trying to change the porters’ working conditions from a collective agreement (which gives them collective protection) to an individual contract and has found a powerful aid in the City of London Corporation, who is currently making the funds (£2.5 million) available to the merchants to buy out the porters. The question is, what is the motivation to so determinedly get rid of 102 working men? The last point appears key. This area of London, its financial hub and primarily the venue for the city’s 2012 Olympics, is undergoing massive redevelopment, particularly in regard to transport links - for example, the new Stratford International and Cross Rail stations. As such, real estate values around Billingsgate are at a premium. The porters themselves believe that the fish market will be relocated; and that getting rid of them and their organized, historically protected workforce, was the first step to make this possible. 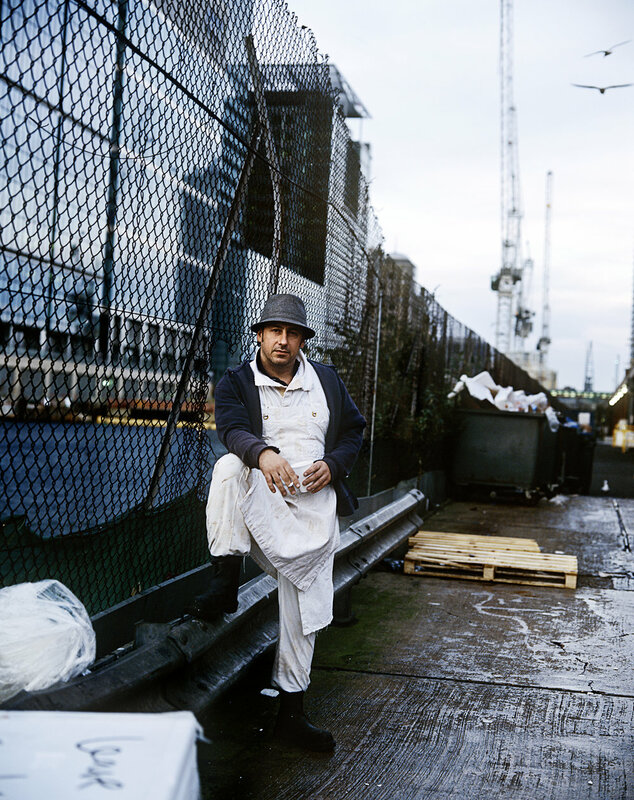 My interest in the Billingsgate porters’ story stems from a fascination with the disappearance of manual labour; work generally considered menial by our society, yet carried out with a great deal of pride and passion by those small communities involved. These groups have often functioned as their own micro-cultures; by eradicating them, longstanding heritage and identity disappears.